Wanyi Lu, a Ph.D. candidate studying under associate professor Zunli Lu (no relation) in the College of Arts and Sciences, is the lead author of a groundbreaking paper in Science magazine. "Most studies of oxygen history focus on the atmosphere and deep oceans, with implications on the evolution of life," Zunli Lu says. "We believe the oceanic oxygen level in the water column above the continental shelves [i.e., the upper ocean] may have been a different beast." Central to the team's research was a geochemical proxy that Lu pioneered in 2010. Using a novel approach based on iodine geochemistry, he and his colleagues measured the ratio of iodine to calcium in calcium carbonate minerals and fossils. Timothy Lyons, Distinguished Professor of Biogeochemistry at the University of California, Riverside (UCR), considers iodine geochemistry a "powerful tool" for constraining oxygen conditions in surface-to-near-surface conditions of the ancient ocean. "These are the waters in which the earliest animals first appeared, evolved and advanced toward complex ecologies," he says. "The results from this study reveal previously unimagined environmental dynamics in those early waters, and those conditions must have impacted animals." The Syracuse geochemist illustrates his point by describing a thick haze of methane that originally enveloped the planet, leaving little to no oxygen in the atmosphere. Photosynthesizing microbes eventually produced enough chemical energy, causing free oxygen to accumulate in the atmosphere. "This set the stage for the Great Oxidation Event about 2.3 billion years ago," he says. "Our iodine data is consistent with a major rise in the atmospheric oxygen level that occurred around 400 million years ago," says Lu, whose doctoral studies involve low-temperature geochemistry and global environmental changes. "Nevertheless, upper-ocean oxygen levels did not stabilize at near-modern conditions until 200 million years ago, when larger eukaryotic plankton dominated the world's oceans. The timing makes perfect sense." Andy Ridgwell, professor of Earth Sciences at UCR, developed GENIE's signature modeling framework, which composes a range of ESM simulations over various timescales. "The innovative way that the Syracuse team combined measurements of ancient rocks with a complex, mathematical model of the global climate system and carbon cycle was impressive," he says. Ridgwell lauds the main conclusion of the team's final analysis—that a fundamental change in eukaryotes led to greater re-mineralization depth of organic matter and, ultimately, a "resiliently oxygenated" upper ocean. "This fits perfectly with our developing understanding of the key evolutionary steps taken to create the planet we have today," says Ridgwell, who studies biogeochemical modeling and long-term climate change. Lee Kump, dean of the College of Earth and Mineral Sciences at Penn State, says the group's findings are a potent reminder of how Darwin's theory of evolution may be only half-right. "Changes in the environment affect biological evolution, to be sure, but biological innovation can affect the environment, even at the global scale," says the renowned paleoclimatologist. That is not the end of the story, however. 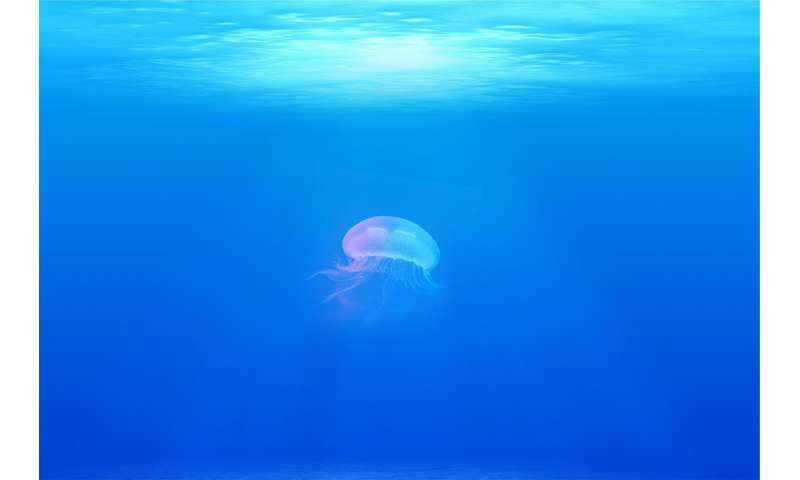 Ros Rickaby, professor of geochemistry at the University of Oxford (U.K.), says the findings also reinforce the link between oxygenation and marine animal body size. "It is incredible to think that the increasing success of microscopic mineralizing plankton out in the ocean, through the change in oxygen distribution, could have had such far-reaching effects across the Earth system to boost the average body size of animals," she says. "It reminds us of the intricate interconnection between every part of the marine ecosystem." Adds Zunli Lu: "It is a prime example of the co-evolution of life and the planet."